Building a fire is different from lighting a fire. When you manage to light a fire, it is essential to keep it going so that you can build a fire. Having a fire is crucial especially when you’re in the wilderness or outdoors with no heat source. It is also for safety purposes because fire helps to keep animals away. In fact, there are a few ways you can ignite fire. This can be done with the use of one item or a combination of multiple items. For example, common tools to ignite a spark include sticks, magnifying glass, a combination of battery and steel wool, and a dead lighter. Here are some guidelines on how to build a fire. Before you work hard on igniting that spark, first prepare tinder. This is the material that catches the initial flame and transfers it to the kindling. If possible, avoid using damp kindling. However, the kindling will dry out when the tinder is burnt long enough. To create tinder in powder form, you can use dry stick and bark pieces. Some of the other items you can use are paper, lint, wax, dry grass, moss, and dry needles from coniferous trees. Place the kindling in a large surface. After kindling ahs been gathered, move on to gather fuel. Fuel allows the fire to burn steadily for a longer period of time. Sources of fuel include animal dung, coal, peat and dry wood. When the fire is established, you can also opt to use wet fuel. It will burn slower than fry fuel. Remember that hardwood burn for a longer period of time, and emits more heat compared to softwood. The next step is to clear a circular area and build the area using a ring of rocks. T\you can further insulate the fire by building a ring of stones. If you are building on a wet surface, cover the earth with green logs and a layer of stones. You should also place a bucket of water just in case the fire gets out of control. To arrange the tinder and kindling appropriately, you can either build a tepee (cone shape), log cabin (layers in alternating direction), pyramid, lean-to, cross-ditch, or most popularly, star shape. You can find out more about these shapes via various sources. Surviving in wilderness requires quick thinking and logic perception. 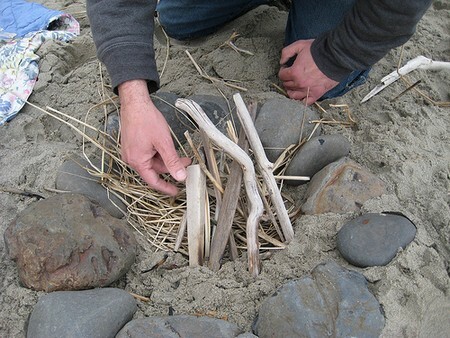 Building a fire is one of the most basic survival skills that everyone should master. These steps on how to build a fire are meant as general guidelines. To further understand, you should give it a try.